Insert as much of the cutter shank as possible into the collet, with at least three-quarters of its length as a minimum. At the same time take care that the end of the cutter shank does not bottom on the motor spindle or there will be a hammering action causing vibration, a poor cut and possible cutter slippage. The ‘three-quarters’ rule obviously does not apply to special long-shank cutters. with these, as much of the shank as possible, consistent with depth of cut, should be inserted. Some collets e.g. those on Hitachi and the Triton router are very shallow. With these you just do the best you can, and try to avoid the use of long-shank cutters. Many routers e.g. Trend T3 and T5, De Walt DW613 and 615, Draper RV850, have primitive depth-stop bars that do not lend themselves to precise depth setting. A quick and accurate method of setting depth of cut with these routers is to use the shanks of your twist drills as feeler gauges between the turret screw and stop bar. The feeler gauge idea can be extended by collecting ‘fingers’ of boards of known thickness. The ordinary car mechanic’s gauge is often useful for tiny adjustments. 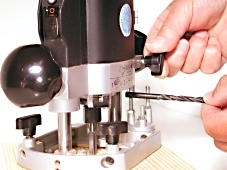 An alternative to the twist drill is the vernier gauge, which gives a much wider range of adjustment. Optimum speed is also dependent to an extent on the shape and purpose of the cutter. 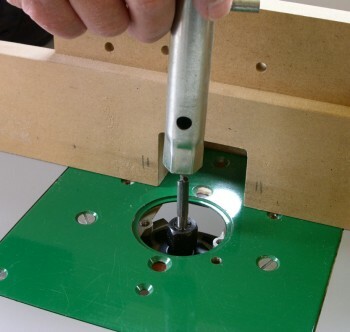 Many cutters are designed for use in a router table at a specific speed. These speeds should be adhered to and such cutters never used in a hand-held router. 2. You adjust router speed to suit the material being used e.g. you will almost certainly want to rout Perspex and other plastics at some time or other and the best cut will be obtained with the router slowed right down. 3. You will encounter the occasional tough, bone-dry piece of hardwood where the general rules about router speed simply do not work, especially when moulding end grain. I have had occasions with a cutter of only ½”diameter where the router had to be slowed to less than half its maximum speed when moulding the end grain of oak. The photo shows cutters with and without plunging centres. The three on the left have the centres the three on the right do not. Straight cutters of diameter greater than about 8mm should have a centre carbide tip in the bottom for a faster cleaner cut when plunging. Straight cutters without this tip are not really meant to be plunged: they are intended for cuts made from the edge of a board, such as housings. If you wish to plunge them you are supposed to begin the cut with the cutter raised and plunge gradually to its depth setting as the cut proceeds. This process is known as ‘ramping’. All appropriate Wealden straight cutters have the centre tip but not all makes, including some expensive ones, do. Inserting and removing cutters is not the easiest of jobs with most routers in a table. For many straight cutters and some others such as flush trimmers, the task can be made easier by using a box spanner and a tommy bar. The box spanner is dropped over the cutter on to the collet nut and turned with the tommy bar. The motor spindle is held with the spindle lock or a spanner. Many medium power routers have hexagonal collet nuts of 17mm. Larger routers have nuts of 22 or 24mm. The cutter must be narrower than the box spanner, but you will find many occasions when you can use it. Box spanners are not as easily come by as they once were, but they can usually be found in a motor factor’s.